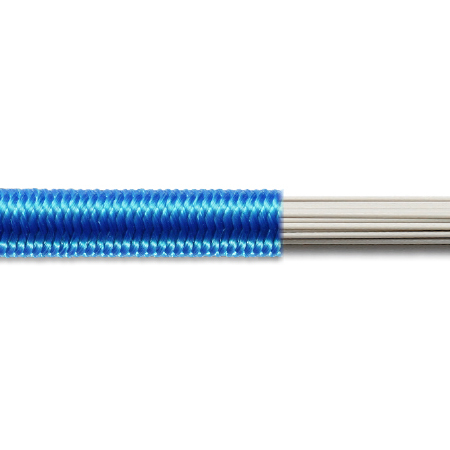 Robline shock cord, also referred to as bungee, consists of stretchy rubber core with an abrasion resistant cover. The multi strand core is long lasting and provides excellent elasticity without permanent elongation. Multiple colors and patterns are available. Polyester covers provide moderate abrasion resistance while protecting the shock cord from UV degradation. 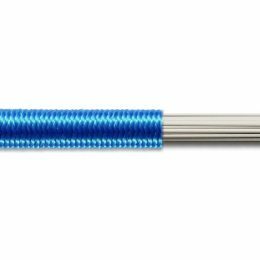 Dyneema covers provide a superior abrasion resistance and should be used where the shock cord rubs on sharp or uneven surfaces. Categories: Rope, Shock Cord & Bungee. Tags: industrial hardware, ronstan rope, shock cord, shockcord. Robline shock cord or bungee cord, consists of stretchy rubber core with an abrasion resistant cover. The multi strand natural rubber core is long lasting and provides excellent elasticity without permanent elongation. The outer cover is intended to protect the rubber from damage and ultra violet degradation. Choosing the correct cover material depends largely on the application, Polyester covers provide moderate abrasion resistance while Dyneema covers provide a superior abrasion resistance and should be used where the shock cord rubs on sharp or uneven surfaces. It is important to consider the fit of the cover on the rubber core. this cover cannot be too tight as it would restrict the elongation. Likewise, if it is too loose it would cause chafe or result in the cord walking off of pulleys and turning points.